Fruit size is an important factor in a fruit crop’s marketability. 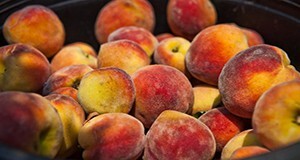 This 6-page document discusses fruit thinning, a process that is critical to achieving larger-sized peaches, and thus is critical to the success of peaches grown in Florida. Written by Yuru Chang, Ali Sarkhosh, Jeffrey Brecht, and Peter Andersen and published by the UF/IFAS Horticultural Sciences Department, January 2018.